We have gained recognition as an eminent enterprise, devotedly engaged in offering Oil Skimmers for machine tool, heat treatment etc. The given oil skimmer is manufactured at our end utilizing premium quality material by keeping in mind the set industry norms. Oil skimmers are pieces of equipment that remove oil floating on the surface of a fluid. In general, oil skimmers work because they are made of materials to which oil is more likely to stick than the fluid it is floating on. At the same time, the fluid has very little attraction to oil skimmers. Our rich industry experience in this field enabled us to provide a wide range of Oil Skimmers to our reputed clients at reasonable prices. - Compact Structurem Easy to be relocated. - All the panels were rust preventing painted, that efficiently prolong the life time of the machine. - Specialy Designed oil transferring belt improves the efficiency and durability. - the special alloy aluminum pulley allows the belt operating more smothly. Easily installed in coolant Tanks to recover tramp Oil Skimmers etc. Helps recovery of costly oils, aids prevention of bacterial growth, increase, the coolant life and reduce consumption of filter media. Available in different sizes to suit customer requirements. High Force Hydraulics Pvt. Ltd. These skimmers are equipped with floating threshold set at the contact point between the hydrocarbons and water. 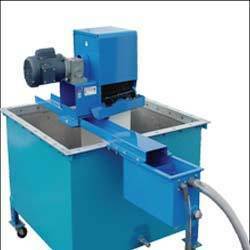 As a customer-focused organization, we are providing a wide array Oil Skimmers. In addition to this, we are providing these products at very leading prices. - Belt Oil Skimmers remove tramp oils from coolant tanks, CNC machines, part washers etc. Rcube Enviro Solutions Pvt. Ltd.